Researchers are mapping the greatest sources of stress on the Great Lakes to better target where and how restoration funds are spent. 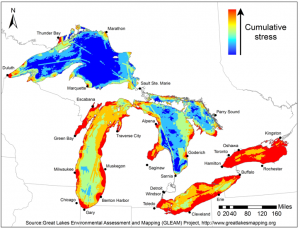 The Great Lakes Environmental Assessment and Mapping Project is the most comprehensive look at the status of the lakes to date, said Peter McIntyre, an assistant professor at the University of Wisconsin and a senior author of the study. Scientists led by researchers at the University of Michigan and University of Wisconsin-Madison report this week in the Proceedings of the National Academy of Sciences that they gathered information on 34 Great Lakes environmental challenges. They included such things as polluted runoff, invasive species and habitat destruction. The researchers asked scientific and policy experts to assess the relative impact of different stressors to one another in particular areas of the basin. They plotted that information as data layers on the map. Researchers also took into account the services that people receive from the lake, including beaches, fisheries, marinas and bird watching spots. Visualizing where the threats and benefits overlap helps us be more strategic in our restoration efforts, said Patrick Doran, director of conservation for The Nature Conservancy, in Lansing, Mich. The goal is to make restoration priorities based on community priorities, McIntyre said. “If what you care about is bird watching areas and you want to do a restoration project to enhance a place that is recognized as an important bird watching area, our comparison of the threat map to the bird watching areas allows the community to identify and create their own response based on the level of threat they want to alleviate,” he said. The researchers found that areas of high contamination were also the areas that provided the largest amount of services to people, meaning the places that people value the most are also most at risk. Often restoration efforts focus on one stressor at a time, but this study provides a more comprehensive level of data, McIntyre said. That makes restoration more effective by taking into account every stressor in play in a particular ecosystem, Doran said. The map could be used as a tool when making decisions about where to funnel restoration funding such as the Great Lakes Restoration Initiative. That federal program began in 2009 and entails proposed expenditures of $5 billion over 10 years. “We are big believers in the Great Lakes Restoration Initiative and we are trying to provide a new resource that would allow, in the next round of funding, decisions that would allow strategic selection of sites based on the entire assembled set of threats and also focused on the locations where people are directly using the Great Lakes,” McIntyre said. So far the initiative’s projects appear in line with the map. The map may help guide the initiative at current restoration sites as well as target future projects. The opportunity for strategic restoration projects in lower threat areas is another benefit of the project. “Often places that may seem to not be in deep trouble because there are no acute symptoms are facing a broad suite of threats that are affecting the ecological health of the system even though we haven’t perceived it yet,” McIntyre said. Many restoration projects begin on an “emergency basis” in response to particularly high levels of contamination and stressors, McIntyre said. Working in areas with lower threat levels could be a preemptive measure to keep them from ever reaching emergency levels of degradation. The project also helps gauge progress. The study was initiated at the University of Michigan and supported by the Fred A. and Barbara M. Erb Family Foundation. Additional funding was provided by the Nature Conservancy’s Great Lakes Fund for Partnership in Conservation and Economics and the University of Wisconsin-Madison. Alan I agree, but the hand of man AKA the will of the DNR is to protect an invasive species alewives. Everything in nature is connected, safe for alewives safe for all. I don’t like windmills, but they can be removed. Biopollution increases if left unchecked, and it’s killing the entire system. “Nature cannot be amended but in her own Nature” Man fights for who controls the lake, nature controls the lake. Man can’t change that. We can work with nature or continue to try to force nature. The greatest threat to the Great Lakes isn’t the Asian carp, alewives, algae bloom or other invasives – it’s from the hand of man. An Ohio not-for-profit, LEEDCo, is currently trying to force a disgusting offshore wind factory in Lake Erie that will be the beginning of industrializing the entire Great Lakes system with thousands of 500 foot tall behemouths that will ruin the lakes for the rest of our lives – kill birds, harm the environment, devalue lakeshore property, create unwanted noise, destroy the viewshed and far more. Ontario has already placed a moratorium on offshore turbines in the GL off the coast of Ontario while the past Governor of Ohio signed legislation on his last day in office to allow leasing of Ohio’s Lake Erie bottomlands to private interests and is contrary to Ohio’s Public Trust Doctrine. This type of development was already defeated in NYS in 2011 when the New York Power Authority tried to do the same thing. Also Lake Ontario is threatened by authority – Since about 1999, most Lake Ontario South Shore property owners have enjoyed fairly consistent regulation of water levels. This consistent regulation has meant that erosion and flooding of Lake, Bay & Pond property has been easy to control and has occurred at a manageable rate. Now the International Joint Commission has decided to change the way the level of Lake Ontario is controlled and we believe that the new regulation plan (BV7) could mean serious property damage to those of us who live, work or make a living along the shores of Lake Ontario and it’s bays and ponds. The IJC, DEC, DOS and NYS estimate that a little over $3,000,000 in damage ANNUALLY will occur. Others calculate this estimate to be grossly understated and most believe it to be as much as 10 times that amount. The IJC, against the advice and concerns of many state and local officials and thousands of property owners has decided NOT to continue with Plan 1958D and is trying to push a new plan being lobbied for heavily by NY State and the DEC. Please help the GL by fighting any efforts to populate the GL with unwanted, unneeded wind turbines. Beware of the “hand of man” – this is the real threat! Good job Jim, Thank You. This Map and the Researchers have provided a stunning service and picture of reality of what is happening through various, combined and cumulative actions and force. The threats to the Great Lakes exist and will increase in degree unless drastic action is taken, action that is comprehensive and integrative in approach and sweep. That comprehensive approach is the public trust doctrine, a set of ancient principles with dynamic and modern application, recognzied by U.S. Supreme Court, all 8 Great Lake state courts, and provinces of Onatario and Quebec — although it’s known as the right of paramount public navigation, fishing, and similar uses. Governments have a duty, enforceable by citizens, to protect integrity of quality and quantity of water and ecosystem from one generation to the next. http://www.flowforwater.org. Thank you. As a boy, growing up in Buffalo, my father regularly went fishing on Lake Erie. The prize catch was blue pike, which my mother made into a traditional fish fry. I haven’t had any blue pike lately. Invasive species and Asian Carp are spread far and wide. Barriers and dams only put thier “control” in one spot, and does not reduce the invasive population. Thus the threat remains. Making a waterbody a hostile environment to invasive species (predators) protects the entire waterbody, and minimizes the invasive species impact. Too many invasives of course make the waterbody hostile to native fish. I’m all for habitat restoration, however all these advisory committees are useless. The plan for Lake Michigan is to convert spawning gounds/nursery areas for salmon and trout. Restoration for native fish, is a threat to alewives, salmon and trout. There is already millions of dollars in studies that tell us exactly what we need to do, all worthless because we have to have a safe habitat/environment for alewives. The DNR’s have to power to reject any advisory groups advice. Which they do unless it’s in the alewives favor.